As little ones are carried into a happy yet calming world of music and nursery rhymes, the programme can be used at home as part of your little one's bedtime or naptime routine. Try using it to sooth and relax them and help you get them snuggled into bed without any fuss. 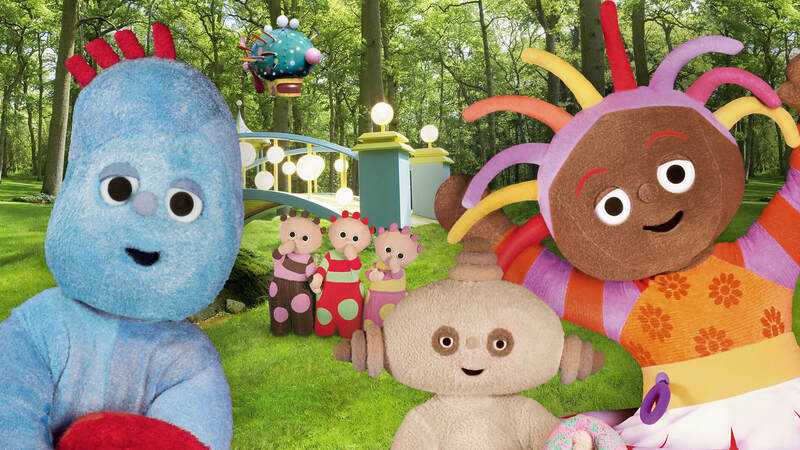 Come and meet all your favourite In the Night Garden characters and watch some clips from the programme. In the Night Garden takes children on an imaginative journey. Igglepiggle and other Night Garden characters are real friends to some small children. Inspired by magical journeys in episodes, your little one may then live out their own adventure through imaginative play. In the Night Garden works in partnership with child sleep specialists and early year’s educational practitioners, our aim is to help little ones grow. The stories introduce the children to a fantastical and magical In the Night Garden world and characters. As they discover, you may see your little one mimicking their favourite character or acting out their own adventure through play. It may sound like nonsense to us grown-ups but to a small child learning to speak, the strange repetitive and rhyming utterances of their favourite characters is fun and may encourage early language acquisition. The story is, told by a narrator using simple words spoken with the clear diction and offers wonderful balance. Discovering that each action has a reaction is one of the wonders of early childhood. In the Night Garden often in a very funny way, shows cause and effect narratives that will provide delight and joy to little ones. Our In the Night Garden characters are friends that always help and support each other. They share and they think about each other, presenting a role model that children may emulate. For example, the sharing of a ball or the giving of a gift in recognition of friendship. Very young children are learning how to move their bodies and music is a fantastic way to inspire movement. In the Night Garden includes funny sounds as well as music to accompany movements on screen and you may see that you little one likes to join in and imitate their favourite characters movements themselves. Helping your little one to understand the pace and beats of their day is important to young children. The familiar world of In the Night Garden shows children their favourite In the Night Garden characters going to bed at the end of each episode, presenting a magical bedtime routine with a story, dance and sleep. You can watch In the Night Garden and its loveable residents on the CBeebies Channel, our brand new YouTube channel or by downloading your favourite episodes from iTunes or Amazon Instant Video. Buy all your favourite episodes from Series 1 or 2 of In the Night Garden on Amazon Instant Video. There are 40 episodes to choose from and prices start at £1.89 for one episode. Buy In the Night Garden episodes from iTunes. There are five episodes to buy individually or you can purchase them all in the full first volume. Prices start at £1.89 for one episode. Watch a variety of clips and full episodes on the Official In the Night Garden You Tube channel. Subscribe to build your own playlists and receive notifications of new episodes. Helping your little one to understand the pace and beats of their day is one of the most important things they can learn at this early age. The familiar world of In the Night Garden and the structure of each episode is designed to help children feel safe and secure with the routines and rhythms of their day.